P2005 - will it be rebuilt? A rather battered looking P2005 seen at United Goninan's Bassendean works on 1 October 2001. 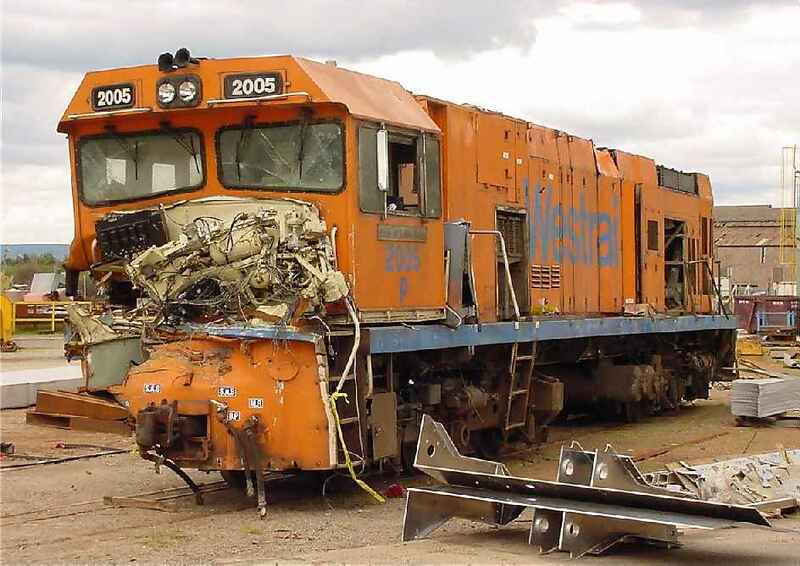 The P class was unfortunately involved in a level crossing collision with a car and a semi trailer on 10 July 2001, sadly 2 occupants in the car were killed. While an insurance claim by Australia Western Railroad is being processed, it is not known if P2005 will be rebuilt or scrapped. Locomotive overhauls for United Goninan have all but dried up at present with only DA1575 currently in the works and presumably DA1577 to follow. This will complete the DA contract signed by Westrail and AWR will almost certainly be using it's preferred supplier EDI Rail, for all future locomotive overhauls. Permission was sought from United Goninan prior to taking this photograph.